Protesters have demanded to know how many more trees a council plans to fell after 173 were removed from streets. The felling is part of South Tyneside Council's programme to replace broken pavement flags with Tarmac. South Tyneside Tree Action Group said it was "appalled that so many trees have already been chopped down". The council said it was "not always possible to retain the trees due to their size, the extent of their roots and their condition". "While the loss of any tree is sad, in such circumstances the works are necessary to ensure the safety of pedestrians and to reduce the risk of injury," a spokesperson said. "We only remove trees as a last resort after very careful consideration." The protest group said the council had been unable to say how many more trees would be felled. Co-founder Rachael Milne said almost all the remaining mature street trees were under threat. "The council intend to continue with their plans to replace all our pavements and it seems that if trees are in the way, they have to go, " she said. The council said it had a like-for-like policy of replacing every tree removed, "but in a more appropriate location". However, Ms Milne said "even if saplings are planted somewhere else like a park, that is not replacing valuable street trees". Many do not survive, due to inadequate planting, insufficient aftercare and vandalism, she said. 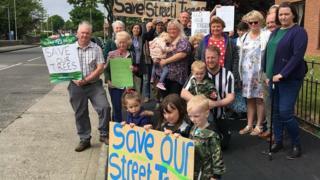 The group is asking the council to consider alternative solutions to maintaining pavements around the trees which it has learned from campaigners in Sheffield. Fierce opposition to tree felling in the city has made headlines, with 5,500 trees brought down in the city since 2012.